In general people seem to become more and more privacy aware. While a couple of years ago social media and its related public sharing were a major trend, nowadays a kind of reverse trend has emerged. On the one hand people seem less comfortable with sharing everything with their hundreds of followers and friends on social networks like Facebook and Twitter, but complicated privacy settings make more private sharing a nuisance. And on the other hand people seem more worried what happens with their content and data, and how it might be used by these networks without their consent. Thus in order to stay in control of their privacy, people increasingly turn to messaging apps which can make it quite easy to privately share. There are some good examples of how messaging apps can help people to protect their privacy, and also some issues to be aware of. I guess an extreme example of privacy protection with a messaging app is Snapchat, which is mainly used for photo sharing. The sender determines how long a photo is visible for the recipient (the maximum viewing time is 10 seconds), and afterwards the photo is not viewable anymore. The app is a big hit among teens, who use the app for sometimes doubtful use cases, which are also referred to “sexting”. Having said that, while sharing “self-destructing” images seems to do a job, for sharing everything else (text messages, locations, links, etc.) the app is useless. Besides the user interface is very basic, and people who look for beautiful design will be rather turned off. Facebook already cloned Snapchat with the app “Poke”. However, Facebook is probably not the right choice when it comes to privacy. We generally expect that “self-destructing” content will become a feature of messaging apps and social networks. So for those of you who don’t need this right away, simply wait a couple of months and your messaging app of choice will probably include such a feature. Most messaging apps (e.g. Whatsapp, Line, WeChat, ChatOn, FB Messenger) have group chats by now, which more and more people also use for private sharing with groups. Well, group chats are pretty useful for coordinating, but for private sharing they are far from perfect. First, the chats with the bubble style are not clearly laid out and can be confusing, especially when it comes to sharing content like photos, links and locations. And second, setting up and inviting people to a group is still too complicated and not really adequate for personal sharing. Our preferred solution for private group sharing is an app called Grouptime, which is a private social network that combines group messaging and classical social network sharing. With its beautiful and simple to use interface, the app makes it actually really easy to personally share all kinds of content with the people you choose. Besides grouptime allows you to share multiple photos at once, and displays large images of contents like locations, links and photos. Due to a recent blog post it seems that privacy protection is very important to Grouptime. So if your looking for an app to privately share with family and close friends, and haven’t tried Grouptime, check it out. This is more a side note, but an important one: Messaging apps that include advertisements, normally need to analyze and mine user data for better targeting of ads. So if your privacy is important to you, make sure to choose a messaging app with a business model that does not rely on advertising. We would choose an European messaging app (e.g. Grouptime, Moped, Threema, Yuilop, MySMS, etc. ), simply because Europe has by far the best law enforcement and civil rights when it comes to privacy and data protection. Especially the US-based services were not always the best examples when it came to security and privacy protection in recent years….not to mention the lack of privacy laws in the US. While for many users encryption is not a must-have feature (who wants to spy on me anyway? ), nowadays it is often a standard practice among messaging apps to encrypt the communication (e.g. via https) as well as a users data. If this is a must-have feature for private sharing for you, simply check with your messaging app of choice. The required information is normally available directly on a providers website. In the last weeks several instant messaging providers launched major updates of their apps. Most apps simply seem to copy other messaging apps or improve the more common features. Some messaging services seem to focus more on certain use cases and try to follow new trends. Grouptime launched a major update of their iPhone version last week. This app is a good example of a differentiated use case. So if your are looking for a group messaging app where you can privately share with family or best friends with one click, Grouptime will probably the right solution for you. While you can use the app for 1:1 instant messaging, it is obvious that Grouptime concentrates on group messaging and group sharing. The redesigned message inbox of the new version of the app reminds me of a private Facebook feed, and thus their idea of a real-time private social network becomes evident. The update includes new features, redesigns, performance improvements, iOS6 readiness, and many bug fixes. My impression is, that Grouptime has developed a beautiful, stable and well performing app. Kik introduced “Kik Cards” in their recent app updates. Kik Cards are optional features e.g. to share YouTube videos, find and share images and edit sketches. The advantage of this user interface design is that the app is kept simple. On the other hand some other messaging apps integrate these features simply as part of their attachments, so I am not sold on the idea of Kik Cards. It is probably their way to start monetizing third party services and applications being integrated into their service. Especially in Europe Whatsapp has gotten a lot of bad press and negative feedback from customers, due to the lack of security of the service. For the last 12 months or so the leading instant messaging app has launched various updates to fix these security issues, but almost instantly security experts found new issues. No matter how important these security issues are for the average user of an instant messaging app. Still, it is kind ridiculous that the current market leader in the messaging space doesn’t manage to fix these things entirely. Whatsapp optimized their iPhone app for iOS6 and included some minor bug fixes in the recent update. Their Android update focused on fixing security issues. Let’s see how many days it takes this time until someone finds a way to break into an account. Line, Kakao Talk and WeChat – the Whatsapp clones from Japan, South Korea and China repectively – all recently launched updates for their messaging apps. In addition to instant messaging, some of these apps offer VOIP calling, a social network feed like Facebook, integration of third party services and many more features. While all these messaging apps are very popular in Asia, the amount of features make them very cluttered and some users might find them confusing. Personally I am more a fan of messaging apps with a clean design, a clear use case and a simple user interface like Kik and Grouptime. Instant messaging apps use the data network of your smartphone to send messages cost-free via the internet. All you need is a data network for internet surfing, which most users have included already in their mobile network operator tariff or have available via public or private WiFi networks. Thus sending messages with instant messaging apps is completely free of charge. For teenagers and young adults, who often send 100 messages per day, and previously had to pay $0,05-0,20 per message, this means huge savings. Instant messaging apps nowadays work the same way as texting (users receive a push notification on their smartphone for new messages), but offer users far more functionality. While classical texting allows users to send simple text messages, exchanging photos is often not without difficulties. Instant messaging apps on the other hand allow users to easily exchange all kind of digital contents with friends: Photos, videos, links, locations and voice messages are pretty much the standard among some of the better services (e.g. Whatsapp, Kik Messenger, ChatOn, KakaoTalk, TextMe, MiTalk). Some even allow you to send dates from your calendar, simple drawings, locations from comprehensive data bases, multiple photos at once, etc. Some instant messaging apps even have great group messaging capabilities. Users are able to easily set up group chats with family or friends. These can be used to plan and coordinate activities of groups or privately share digital content (e.g. Grouptime). Besides instant messaging apps show users, if their messages were received and if recipients are online. Instant messaging apps innovate in very short cycles. The competition is hard, and thus service providers regularly improve their apps and launch new features. This is obviously a change from the texting world, where the lack of competition hardly forced the mobile network operators to innovate at all in 20 years time. Nowadays nearly all better messaging apps for iPhone and Android enable users to send a single image (from an album or directly taken). All popular messaging apps like Whatsapp, Facebook Messenger, Kik Messenger, etc. offer this feature, which is fine for quickly exchanging pics with single users. However, especially if you want to share several photos at once, sending single messages in a row can become tiring, and getting several push notifications in a row on the receiving end can be quite annoying. 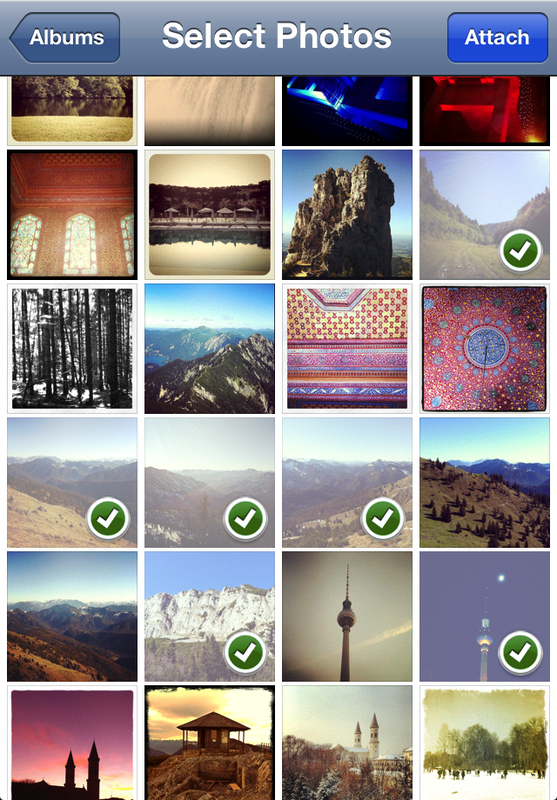 Grouptime recently launched an awesome feature and now allows users to send multiple photos (up to 10 pics) at once. This is great for two reasons: First, several images can be quickly shared at once, and second, the images are shown in a row and make nice photo story in the chat. Another feature required for good photo sharing are captions. Captions allow users to add a description to photos, without having to send an additional message. 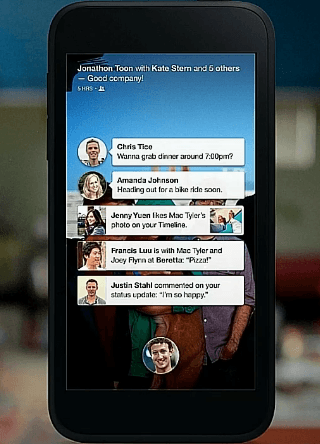 So far the only messaging apps offering captions seem to be Grouptime, TextMe and PingMe. Most messaging apps simply display a photo in a small speech bubble like everything else in a chat. For photo sharing this is not really appropriate because the images kind of loose their beauty. Pics should be presented as large as possible in the chat. Some messaging apps have understood this, and now show beautiful, large photos in the chats. A good example of this is again Grouptime (see screenshot below). Of course to easily distribute photos to several people at once, messaging apps should offer at least simple group chats. Thereby you avoid having to share the same content over and over again in 1-to-1 chats. Besides, the more sophisticated the group messaging and sharing capabilities of messaging apps are, the more powerful the photo sharing with a messaging app gets. Messaging apps that allow you to define groups for e.g. family, friends, etc. make it very easy to share pics with selected individuals with one click. I guess, that is the easiest way to quickly share and exchange photos with family and friends. The messaging app with the best group messaging and sharing capabilities is Grouptime. Other apps with good group chats are Whatsapp, GroupMe and ChatOn. Overall the photo sharing features of messaging apps are quite good. Grouptime is already a very good messaging app for photo sharing, and offers to exchange several images at once. This feels as if you are sending complete photo albums. If the innovation in regard to photo sharing with the messaging apps continues, soon there will be no need for special photo sharing apps anymore. Privacy, data protection and secure communication are always hot topics in the instant messaging and social networking world. Sometimes the issues at hand are greatly exaggerated by the media, however, quite often messaging apps have security and privacy flaws which users should be aware of. There aren’t many messaging apps which serve as a good example of how to protect as user’s privacy and personal data. That’s why today I want to take a closer look which messaging apps offer secure communication. One of the market leading messaging apps, Whatsapp, is definitely not a good example when it comes to protecting a users privacy. Whatsapp has had several security issues in the past. For years on most devices a user’s personal data, content and address book have been transmitted to the server unencrypted. Whatsapp has used HTTPS, but then has sent messages and content unencrypted, and even your ID visible in plain text. Thus in Wi-Fi networks it has been very easy for others to intercept a user’s data and to follow conversations. Actually there is even an Android app called “Whatsapp Sniffer” which allows to easily scan other people’s conversations in the same Wi-Fi. Only recently Whatsapp said to have closed these encryption issues. However, with millions of clients and different version out in the market, it will take a longer time till the existing security issues are really closed. And it remains to be seen if this encryption is a save one at all. Besides Whatsapp is an American company whose privacy and data protection enforcements are generally weak. From a market leading messaging app with millions of users I would have expected a better security and privacy concept. Actually for better privacy and data protection it might be worth looking at European messaging apps, which have much stronger legal requirements in regard to protecting a user’s data. So far a good example is Grouptime from Germany. The Germans have some of the strongest data protection legislation in the world, and regular investigate and challenge the policies and practices of Facebook, Google and the like. Grouptime seems to completely anonymize your personal data and use secure encryption and transmission methods. In addition, the messaging app aims to provide an easy to use private messaging and sharing service by default, so the app has a simple privacy concept by design where no complicated settings are required. For further details read one of Grouptime‘s last blog posts how they protect your privacy and data. One would think that Apple’s iMessage is generally safe. The recent SMS spoofing issues show that privacy flaws currently exist, and also there have been some other smaller security issues with iMessage in the past. I guess, since iMessage and iCloud are rather new services, these issues will be solved by Apple soon. And one of the good things of iMessage is, that data is transmitted encrypted. However, the question for me is, to what degree my messaging data is really anonymized in Apple’s iCloud? Probably it isn’t encrypted on iCloud. The Facebook Messenger is also not a good reference for a secure and private messaging app. Well, Facebook alone has already enough flaws when it comes to privacy and data protection. Recently though, it became apparent that Facebook seems to regularly scan your messages for specific keywords. There are lots of other messaging apps out there. In general, I would say that smaller messaging apps are more likely to have security flaws, that are yet undetected, and that European providers offer better data protection (like e.g. Grouptime). Anyway, SSL encryption (https) should be a standard for messaging apps to provide privacy and security for their users. I will do some more research, and will follow up with more news on that topic in the near term. With the focus on group messaging and sharing, Grouptime offers an easy to use and powerful group chat. You can start group chats very easily by simply entering the recipients, and sending your message. So you don’t even need a title for your message or set up a group. The free messaging app actually operates with instant posts similar to social networks like Facebook and Twitter. The great thing about this approach, is that you can easily start different group chats (even with the same people) for different topics. In addition, if you want you can define your own group (more like a distribution list) for e.g. your family or best friends, and start group chats with one-click. Since Grouptime allows you to send digital content like photos, links with previews, locations, voice messages, calendar dates, etc., this group messaging app is not only great for group chats, but for private group sharing as well. So, for example, you can attach and send multiple photos at once…I guess there is hardly a messaging app that makes group photo sharing easier. Finally, the reduced and clean user interface of this group messaging app and the large content previews, make Grouptime the No.1 recommended app for group chats and sharing. If you have several group chats, sometimes it becomes hard to differentiate the groups. Then you always have to search for the groups among all the open chats. And the biggest problem is, that sometimes my friends have given their groups the same or similar names. So right now for example I have three groups “Best friends”. If I want to share photos or my location with some selected contacts, I don’t want to have to set up a new group chat…this is just too complicated. Besides I find groups inappropriate for personal sharing. And last, the speech bubbles, information tags and features make the group chats in Whatsapp too cluttered and a bit confusing. Also the content is only displayed in small previews. This is ok for 1:1 instant messaging apps, but for great group chats and sharing there are more beautiful and well-arranged user interfaces for iPhone and Android devices. GroupMe is a dedicated group messaging app like Grouptime. However, GroupMe is more complicated and limited in use. The set up of group chats works the same way like on Whatsapp, and the messaging app has exactly the same flaws as described above with Whatsapp. I won’t judge the design of the app, but I can say for sure that some tabs in the app are not really required. And for those worried about their privacy, the mix of private and public groups might be of concern. A benefit of GroupMe is that it also works for group texting via SMS. On the one hand this is good because you can reach people without the app, and group chat in classical texting style. On the other hand this easily leads to confusion: Did the other person get my text message? What happens when I share content like photos or my location…do these things work in group texting as well? Like Whatsapp, GroupMe is ok for simple group chats. Though, when you want easy and powerful group messaging and sharing, this messaging app is not the best service available. Again the group chats in ChatOn have the same weaknesses as in Whatsapp (see above). With one exception, however: The group chats in this messaging app are quicker to set up. The group chat feature of iMessage, only works if other people also have an iOS device and have iMessage activated. Otherwise iMessage just sends a broadcast message (same message to several users) via SMS, and group chats are not possible (but sometimes you don’t know what it will be, before you press “Send”). Needless to say, this can be confusing for users (you always need to know or check who also has iMessage), and makes the group chat functionality and reach of iMessage very limited. Overall, most group chats in messaging apps work similar. Only some messaging have group chats that are easy to set up, and offer great usability and powerful group sharing beyond simple group chats. For good group chats I would recommend Grouptime. This messaging app is currently the best group messaging and sharing service available in the market.